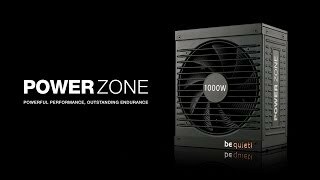 POWER ZONE | 750W silent performance Power supplies from be quiet! Power Zone 750W provides the winning combination of superior performance, rock-solid stability, and advanced cooling. Offering a fully modular cable management, top safety features, deep standby compliance and Intel C6/C7 readiness, Power Zone is of fantastic value. It is designed for powerful operation even at 50° C and is ideal for overclocking thanks to a massive 12V rail. Whether you are assembling a high-power PC or multi-GPU gaming system, you are certain to benefit from the outstanding features. Power Zone 750W delivers a best-in-class blend of performance and quality for a reasonable price. With the massive 12V rail design the Power Zone can deliver up to 744W on the +12V rail, respectively 99.2% of the total power. This feature makes Power Zone the perfect PSU for overclocking your CPU and GPU. The high-end Silent Wings 135mm fan with variable speed delivers best-of-class airflow yet produces very little noise. This is thanks to its unique, optimized fan blade design alongside an advanced fluid-dynamic bearing and 6-pole fan motor that largely eliminates operational noise, has a super-long life and minimal power consumption. Up to three case fans can be temperature-controlled by the PSU, resulting in an optimized and quiet system. The “cool-off” feature continues to run the fans for an additional three minutes after a system shutdown, protecting valuable components at their time of maximum heat stress. The use of Active Clamp and Synchronous Rectifier technologies guarantees a very stable operation. The PSU is equipped with DC-to-DC conversion for even tighter voltage regulation under heavy cross-load conditions. This ensures secure operation for next generation processors and graphics cards. Power Zone is designed for powerful operation even at 50°C. Thanks to the fully modular cable management, cables that serve no purpose in the system are left out, which makes for tidier systems and easier installation of the PSU. The uncluttered layout means a smoother airflow, which leads to lower noise and temperatures inside the case. Only the best components are utilized in Power Zone 750W. That is why we have used only high quality 105°C-rated capacitors on both AC and DC side for maximum performance, high reliability and longer PSU life under high load. You are already using a be quiet! power supply and want to upgrade your system with a new POWER ZONE | 750W ? Check here which cables are compatible and don't need to be replaced.